Dr Gregson is a grain grower from Victoria’s Wimmera region with an extensive science and corporate research management background. He has degrees in science (PhD and DSc) and is an Adjunct Professor at the University of Ballarat and a Fellow of the Australian Academy of Technological Sciences and Engineering. Tony is Chairman of Plant Health Australia, the Victorian Committee of the Crawford Fund and a board member of the Crawford Fund; Chairman of the University of Melbourne School of Botany Foundation and a Director of RIST (Rural Industries Skills Training) based in Hamilton, Victoria. 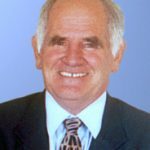 He is a former Chairman of Bioversity International and two CRC’s, former inaugural member of the CSIRO and GRDC Boards, and a former member of the CIMMYT, ANSTO, and Rural Finance Corporation of Victoria Boards.